Super Wubble Just $22.99 Down From $45! You are here: Home / Sponsored / Super Wubble Just $22.99 Down From $45! The NPD Group sent me the new Super Wubble Bubble Ball to check out and tell you about. This thing is so huge and so strong! My Grandson has wanted one for quite some time, so I am thrilled to have gotten it! So what makes the Wubble Bubble Ball so special? It’s made from revolutionary, near indestructible, lightweight material called Xpandium. It’s squishy, squashy, super soft and lightweight and allows it to be inflated to a gigantic three feet tall! You can have your very own Supper Wubble Bubble Ball ready for play in a matter of minutes. Use the battery-operated air pump to inflate your Wubble Bubble Ball in just two minutes. After you’re done jumping, throwing, squishing and kicking, simply deflate your bubble ball with the deflation tool and store it for next time. The best part is that the Wubble is fun to play with indoors or outdoors, all year round. You can use it as a giant soccer ball, tennis or even beach volleyball. Who would have thought that a simple ball could be so much fun? Now grab your Super Wubble Bubble Ball, blow it up and go have a blast! I love that it comes with the pump which means it’s not a gift that requires anything to get going – we all know how disappointing those can be – having to wait for the correct tool to put it together. This is ready right out of the box since it includes the pump! It comes in Blue, Pink, Green, and Red, too! So, you’re sure to find your Super Wubble fans favorite color! 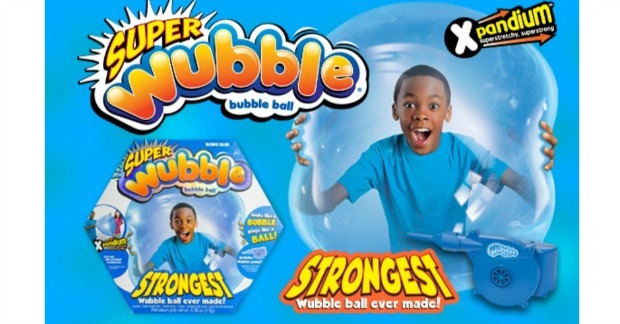 Super Wubble is up to four times stronger and more tear-resistant than the original Wubble Bubble Ball. Made with a new super stretchy material called Xpandium, it’s super smashable and super squashable. Bounce it, throw it, kick it, smoosh it, smash it, even sit on it! See for yourself how Super Wubble holds up in the fun YouTube series, Super Wubble Vs. The World, where NSI International, the makers of Super Wubble, drop all kinds of objects on the giant bubble ball from the top of a building. Watch Super Wubble take on everything from a pineapple and a bowling ball to a shopping cart and a toilet! And guess for yourself: Will it pop? It’s perfect for a birthday gift, or Christmas present, or even just an anytime surprise! Kids of all ages will be thrilled to have it and it can be used for hours of fun! You can get yours today on their website, Amazon, or at Toys R Us!